This excerpt from the Joe Rogan Experience Podcast explores how seemingly good corporate jobs by normal standards are restricting personal growth in society. Joe explains how corporate culture, work/life imbalance, and materialism contribute to a lack of self expression. So, get it together, and this is your life now. No natural behavior, everybody’s wearing clothes they don’t want to wear, everybody’s showing up and doing something they don’t want to do and they have no connection to… that’s the problem with our society. Joe seems to hit on some pretty solid points in this short video. The main point that I find in this is to actively pursue your interests until your passion reveals itself, and then explore that passion until it has given you everything that it can. This video to the voice of Carl Sagan explores the vastness of space in comparison to the relative insignificant size of this pale blue dot called Earth. Sagan continues to illustrate the beauty and importance of the pale blue dot through the movements of life. This dot is the only known vessel for life that is known in this universe, and that fact alone inspires pride and respect for our home… however long we may stay here. The Earth is a very small stage in a vast cosmic arena. Thick of the rivers of blood spilled by all those generals and emperors, so that in glory and triumph they could become the momentary masters of a fragment of a dot. Google engineers may be the first to experience life-extending technologies as a job perk. Google Director of Staffing, Todd Carlisle, hinted at the possibility at the end of a forum on attracting top talent in Silicon Valley. What if where you worked extended your life? If you got the best medical care along with the best job. You would’t want to leave. This idea is consistent with the hire of Ray Kurzweil in 2012 as the Director of Engineering. Kurzweil is the most vocal and reliable proponent of the future technological singularity. The singularity is a time in the future when humans transcend biology to merge with technology; essentially sidestepping death. If this ever came to fruition, how could any other companies compete? Cisco and Twitter were also in the discussion with topics such as: salary-levels, working from home, learning opportunities, and even free food and beer. Those are all nice and well, but compared to evolving a longer life-span, they don’t even register. This is like a video game when your power is really low, flashing bright red, you’re inches from death, and there stands Google across the bridge with an extra life. This short energetic video by Jason Silva asks the question, “Why do we explore space?”. Silva among others believe that it is our desire to expand our consciousness. By seeking new horizons we develop new expectations of what the world is and what it can be. 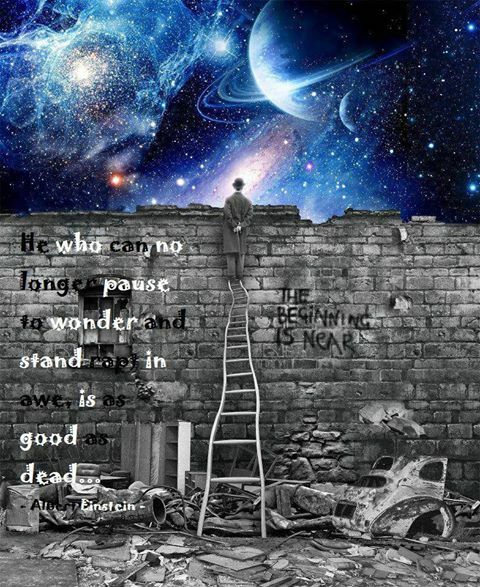 I feel as we explore into the far reaches of the universe, we’re also delving deeper into ourselves. We’re questioning where we came from, what our future holds, and the laws that govern what lies in-between. When we keep pushing beyond all limits, when we get to Kubrick’s “Beyond the Infinite”, the place where dreams are born…through the wormhole, down the rabbit hole… It’s glorious! I like these shots of awe because they are short, energetic, positive jolts of futuristic philosophy. 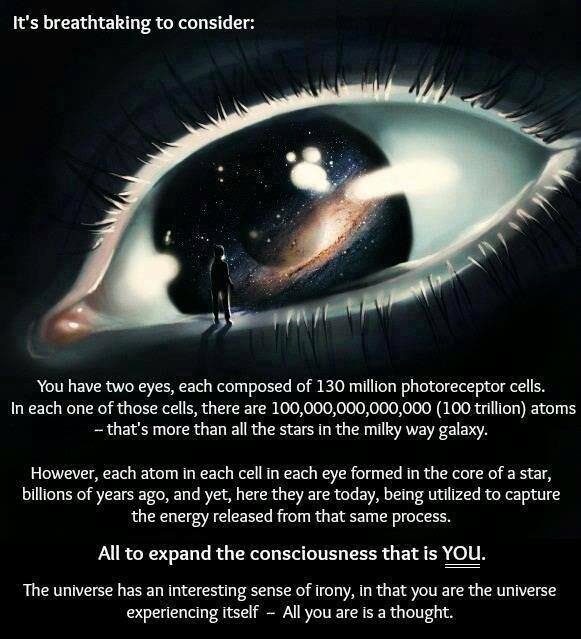 They’re a way to experience awe in compact form, and best of all it’s easy to share with others. I Hope you enjoyed. When we dream of space, we dream of transcendence, we dream of what we might become. “When I look up at the night sky, and I know that yes, we are part of this universe, we are in this universe, but perhaps more important than both of those facts, is that the universe is in us” – Neil deGrasse Tyson on Universal Perspective. The singularity is a term borrowed from physics by Google’s chief engineer, Ray Kurzweil. The meaning in physics relates to the point inside of a black hole at which the laws of physics have completely broken down. Kurzweil’s definition refers to a point in the future at which technology has increased to such a high level that it is not possible to perceive a difference between technology and humanity. Imagine a time in the future that has changed so much that, like physical laws in a black hole, life as we know it to be ceases to exist, and life begins anew in a completely different context. This is similar to the point in our evolution when language developed… try explaining to a non-lingual, pre-human the verses of Shakespeare, or the verses of Jay-Z for that matter. This latest Shot of Awe from Jason Silva ties into a recent theme on this site of creating your own reality, following your inspiration, and spreading the resulting positivity. This video describes living your life as a hero’s journey, or being the protagonist in your life and actively enriching the narrative. These concepts symbolize the process of reflecting inward to discover yourself and your passion, and then being active in pursuing that with as much vigor as you can afford. Life exists in individual moments, and it is up to us to make sure that those moments are vast, interconnected, and grand… [Doing so] to make a masterpiece out of life, one that we would willingly live again and again for all of eternity, this is what we can strive for.